The Black Creek Community Health Centre (BCCHC) serves a catchment area in Toronto, Canada made up of neighborhoods with some of the highest rates of diabetes in the city, according to a 2007 report by the Institute for Clinical and Evaluative Sciences (ICES). The region consists of a diverse community- Asian, South Asian, African-Caribbean, and Latin-Hispanic populations- which has traditionally lacked access to culturally appropriate care. The BCCHC addressed this issue through a dynamic collaboration with the local community. Known as the Live, Learn and Share Community Project, its first initiative had two main goals: 1) to create a culturally relevant guide for developing diabetes peer support groups, and 2) to train members of the community to be peer support facilitators. As the community contained a large Black Caribbean population, Live, Learn and Share directed its initial efforts towards this population. The project used a strengths-based approach, focusing on the assets and capacities of the community and the individuals within the community living with diabetes, in working towards these two goals. To ensure active community input in development of the guide, the Project engaged the help of local residents and community organizations through regular meetings. An advisory group provided an outline for the guide, and multiple actors within the community including residents and literacy groups worked to ensure its appropriateness for the Black Caribbean community. The completed guide, made by the community and made for the community, can be found here. The second goal of Live, Learn and Share, to train community members to be facilitators for peer support groups, was accomplished through the recruitment and training of 16 Black Caribbean community residents with diabetes. They attended a four month series of weekly workshops aimed at providing them with an understanding of both the peer support model and knowledge about diabetes. Following the end of the project, the project participants continue to meet on their own and have successfully started and maintained their own Diabetes Peer Support Group, which meets monthly. Utilizing both a culturally sensitive and engaging approach, this project overcame the taboo among many Caribbean cultures against speaking freely on issues pertaining to diabetes and mental health. 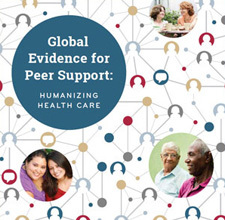 The lessons learned from the project can be used by organizations as they create and manage their own peer support programs for distinct populations. Moving forward, Live, Learn and Share is hoping to train residents from the Somali, South Asian (Urdu-speaking), Spanish, and Vietnamese communities to become Diabetes Peer Support Group facilitators, and translate the guide into these four languages.